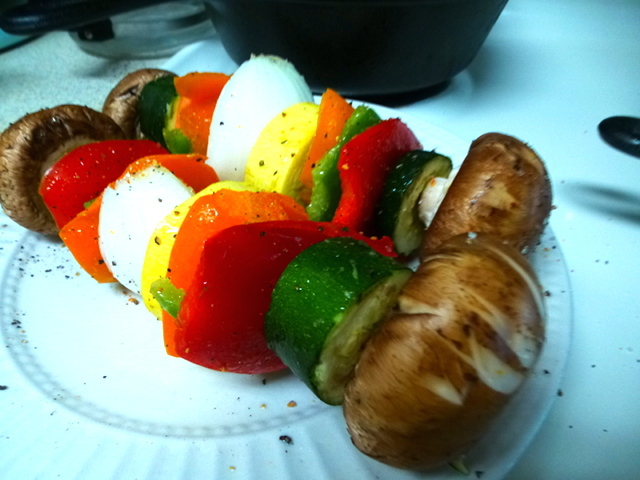 We had some veg skewers as well. It was a nice side for the brie burger. 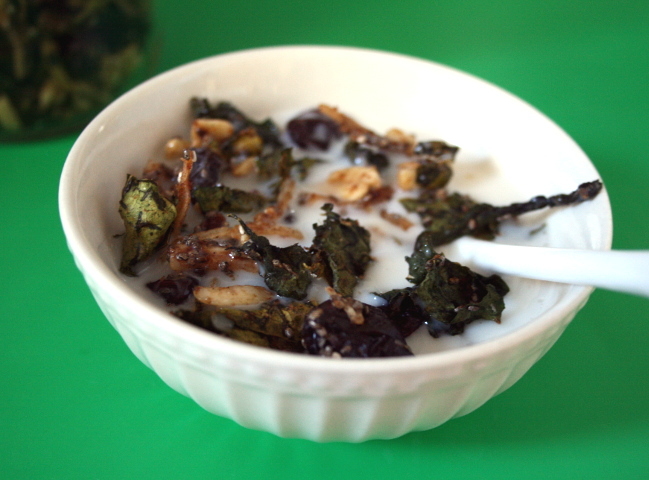 Something fun to eat and not so heavy. We used a ciabatta bun and topped our brie burgers with thinly sliced red onion, sautéed cremini & shiitake mushrooms, and bacon! Tastes out of this world! Great with steak sauce (such as A1) as well! 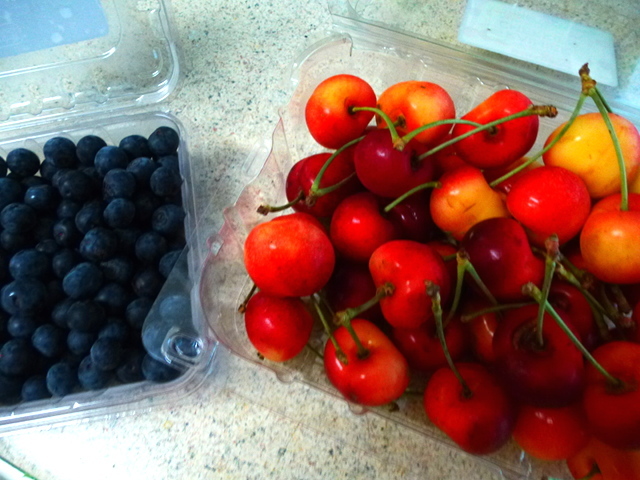 For the dessert, I had to use two of my favorite summertime fruits: blueberries and Ranier cherries. Pretty fuss-free dessert. 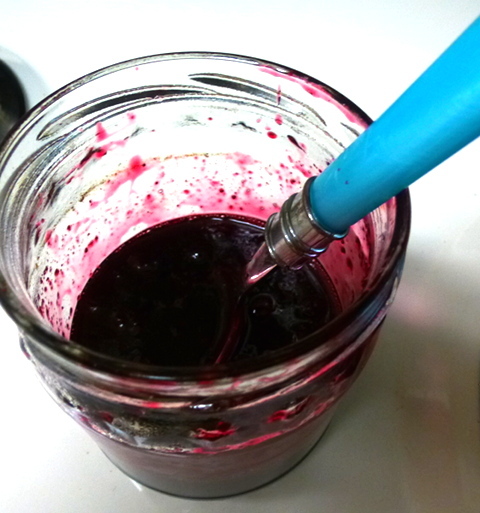 The hardest thing is making the blueberry sauce, but it’s still very easy. This recipe utilizes a good-quality jam to sweeten and thicken the fresh berries without adding any extra sugar, though you may have to for your desired point of sweetness. You can always use your favorite berry sauce recipe instead. For this recipe, in a saucepan, I just mixed together 1/2 cup of fresh blueberries, 1/2 cup blueberry jam, juice of 1/2 a lemon, pinch of lemon zest (optional), pinch of salt, pinch of cinnamon, and 1/2 teaspoon vanilla. I let it come to a boil while stirring periodically and let it cook for about 10-15 minutes until the berries start to burst. Carefully pour it in a glass jar and let it cool at room temperature. You could use your favorite blueberry jam (maybe homemade from a friend?). I used a brand that didn’t have any fillers or ingredients that I wasn’t comfortable with, such as high fructose corn syrup, LOL. I used two spoons submerged in hot water before I started shaping. There’s a one hand method too. We hope you had a good time celebrating! This entry was posted in Cooking, Food, Holidays, Recipes and tagged Blueberry, brie burger, cheese, Dessert, dessert quenelle, Independence Day, Mascarpone, stuffed burger. Bookmark the permalink. The burgers look wonderful, blue cheese and beef burgers are so wonderful and must say your dessert is beautiful and the quenelles are perfect. The fruit and mascarpone makes a light and delicious dessert. Rainier cherries are my favorite. Aww thank you 🙂 I don’t mind paying extra for Ranier cherries compared to the other types. They are so good! Thanks 🙂 You are invited to my place if you ever come to San Diego, CA. Samantha! Absolutely yummy, both the burger and the quenelles! – I wanted to make stuffed burgers yesterday and totally forgot. Darn! Thank you Fae. I hope you got to make stuffed burgers! Seems like any cheese would be good in a burger patty! G’day Sam! I LOVE stuffed burgers, true! Is only brekkie, but could go for one of these now too! Happy Belated July4th and good luck on the move! Thanks! More packing to do, but good thing it is a bit cooler today! It would be fun to have a burger party! Thanks Francesca! Definitely a keeper! Hi Chellet! Thanks 🙂 It would be fun to test different cheeses or other fillings! Thank you. Even though I want to make some more today, I think I’ll hold off until next month. LOL. Pingback: Homemade Stuffed Burgers | Melissa Say What?